For those of you who are still with me after that confession, if you ever had a doubt about this car’s styling (how dare you), you’ll be glad to know that it definitely looks better in person than any picture could even attempt to capture. The lines are so smooth yet muscular, everything feels well-proportioned. I feel like no matter what trim, color, package, and all that you go with, you’ll end up with a good-looking machine. Definitely one of the car’s bright points. This morning before I set out, I was talking to a contact in Europe who said that his experience with a Giulia was less than satisfactory, as it had humongous panel gaps and mis-matched trim. This really frightened me, as one of the defining things that make a luxury car such is the build quality. Luckily for me, I couldn’t find many issues with the build. Everything felt firm and strong to the touch, and the interior smelled of quality leather and material. Ergonomically, the car does fall short a little bit. As highlighted in DeMuro’s review, the b-pillar is humongous, and while it doesn’t hurt entering the car, even for a husky guy like me, it does make blind spots a bit unbearable in quick binds. Also, my left foot kept getting caught in a small pocket in the driver footwell. Not a deal-killer by any means, just a slight annoyance. Another thing that kinda had me worried was how this car would feel on the inside. Would the seats be firm and unforgiving like a Cadillac? Or soft and bed-like, like a Volvo. Well, it’s somewhere in between, which I’m fine with. The bolsters on the rear hug you in, and the seatback isn’t the softest in the world, but the actual seat itself is nicely cushioned, and I could see road trips in this car being very nice. Adding to that dynamic would be all the toys you get, most of which are standard luxury car fare, with a good stereo and all those goodies within. So, the most important part, can this non-Quadrifoglio stack up, or is it best to spend the extra money? Well, even though I only had a short drive around the block, I’d have to say someone going for the lesser model will be left with smiles for miles. The engine feels peppy and strong, and the steering is tight and precise, even if you’re in the daily driver, “Normal” mode. It really makes me wonder what the Quadrifoglio adds...I don’t know if I’ll ever drive one or not, but I’d be pretty damn happy with the regular Ti model. I can’t really say that the Giulia is a bang for the buck, or really a value muncher, but it’s definitely a decent alternative to your 3 Series or A4, or even my beloved ATS. It’s got tons of different packages and trims you can select from, so no two Giulias will really be the same. I’d recommend the Ti Lusso in Montecarlo Blue Metallic over Crema Leather, like the one I drove today. You can find the listing for the magnificent beauty here. 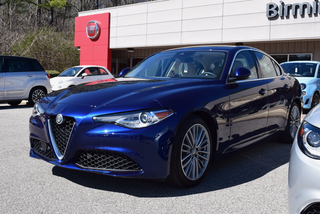 If you’re looking for the perfect luxury performance sedan under 50k, I think the Giulia is definitely the car for you. It perfectly balances good looks with performance and luxury in a package you just don’t get in many places. BMW really shouldn’t brush the Alfa off as a mere pretender, it’s truly a wonderful machine...and if I was a little richer, I’d take her home.